Here at Confessions of the Chromosomally Enhanced (CCE), we like to keep the discussion honest, but positive. There is plenty of negativity out there about Down syndrome and we certainly don't need to contribute to it. As a subcategory of "mommy bloggers," complaining about one's children, expressing regret, or sharing private moments with the public are all areas of concern, regardless of the extra chromosome. It's a line we must be very cognizant of, as our children will someday be able to read these words. Fortunately for me, Down syndrome had such a positive impact on my life that keeping the discussion optimistic is not difficult. 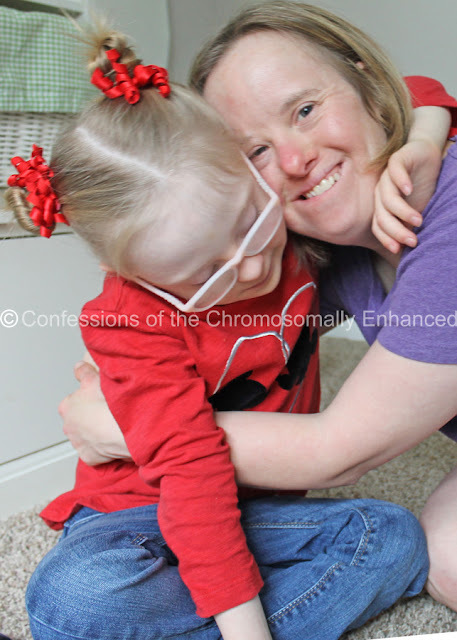 As a parent of a young child with Down syndrome, I know that my challenges are temporary because I see how my sister has grown into a kind, considerate, and mature adult. That doesn't mean that I shy away from documenting the hard stuff, too. I've discussed everything from Josie's open heart surgery, to her chronic lung disease, her G-tube and subsequent struggles to eat orally, right down to her behavior issues. But the aforementioned issues are not universal to all kids with Down syndrome; those were just Josie's struggles. And despite the fact that Josie has had significant health challenges, I would do it all over again, happily, because the joy she has brought to our family substantially overshadows the hard times. Besides, as mothers, we are here to offer unconditional love. Should any of my other children acquire a health issue or disability later in life, I would see them through it without hesitation. This blog has addressed current issues pertaining to Down syndrome including how Chinese researchers are seeking a cure for Down syndrome and how Iceland is striving towards eradicating Down syndrome through prenatal detection and subsequent termination. So when an Instagram follower sent me a link to this video, I was immediately moved and inspired to share it (Thank you, Abigail S.). (You can read his speech HERE). 1. 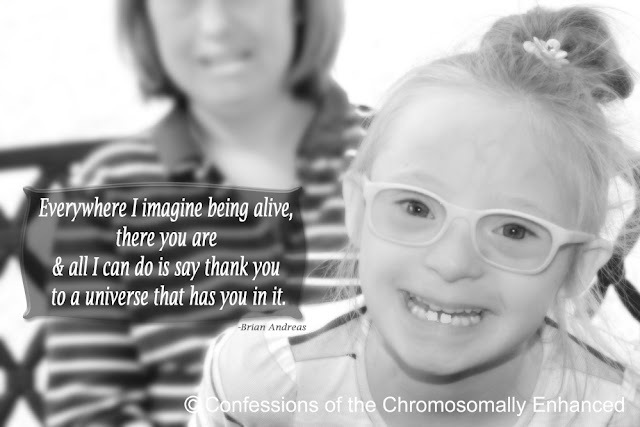 People with Down syndrome are a medical gift to society because they hold the key that open doors regarding cancer research, Alzheimer's, and immune system disorders. 2. A Harvard-based study has determined that people with Down syndrome and their families report significantly higher levels of happiness than the general public. 3. Given the aforementioned points, people with Down syndrome can truly allow Americans an opportunity to carefully consider the role eugenics plays in our society, and how we choose which humans are worthy of a chance at life. To read NPR's article "People With Down Syndrome Are Pioneers In Alzheimers Research," click HERE. Did you know that abnormal protein deposits associated with Alzheimer's are found on the 21st chromosome? Besides, with the research happening now, the Down syndrome population may lead to the discovery of a drug that will identify and prevent the development of Alzheimer's not only for people with Down syndrome, but for the public at large. As Frank Stephens says, "I don't feel like I should have to justify my existence..." and he's right. We are all created in God's image and every human being is worthy of basic human dignity. 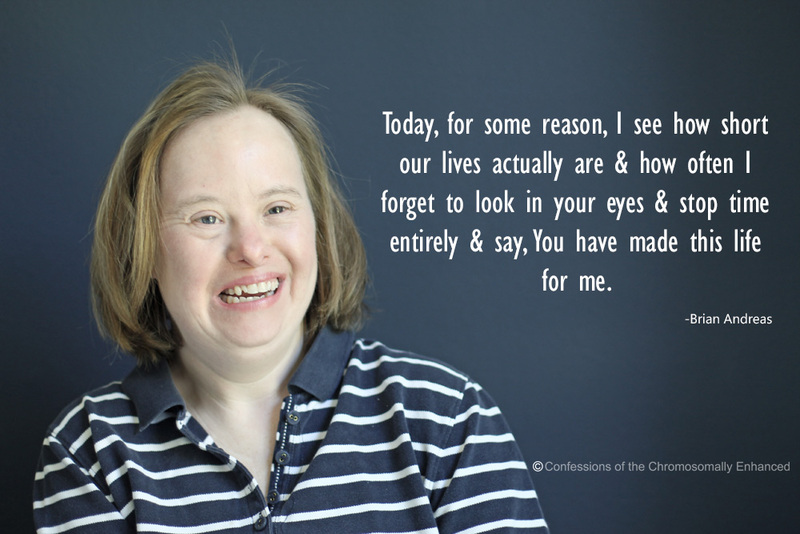 The people with Down syndrome in my life have taught me more about love; how we are called to love and what it looks like to truly love unconditionally. They have flooded my world with vibrancy and joy. That's why it feels so good to be able to share them with you; it's an experience you should seize and absorb. Leanne and Josie, life is truly better with you. I have really enjoyed reading your blog. My daughter was born with Down Syndrome. She has a twin brother. This makes 10 children for us. Your story has been very encouraging. God bless you and Josie and Aunt Leanne.